We’re now firmly in the second half of the 2017 legislative session at the Indiana Statehouse. Indiana lawmakers are busy putting final touches on bills they hope will become law: on topics from preschool to prayer. It’s a lengthy process (here’s our explainer on how a bill becomes law, making your voice heard and other useful tidbits). At this point, it’s not too late for major changes. This week, lawmakers debated the merits of prayer in school, publicizing teacher involvement in unions, protections for student journalists and more. Indiana lawmakers are considering a controversial measure that requires publicizing the percentage of teachers who are union members. In cases where union participation falls below a certain amount, teachers would be informed they can get rid of or change representation. Labor unions say the measure is another “poke in the eye” from Indiana lawmakers who are trying to clamp down on organized labor. The Republican authors behind the bill say that displaying union numbers is about transparency – a defense for teachers who feel bullied by unions. Leona Glazebrooks, a 20-year social studies teacher in Warren Township, testified against the bill. She says teachers have a right to not to publicize membership in a private organization. The House education panel approved the measure 7-4 in a party line vote. Rules around prayer in school also passed out of the committee this week. The bipartisan House Bill 1024 would require the state attorney general’s office to author example policy about religious expression for schools to follow. 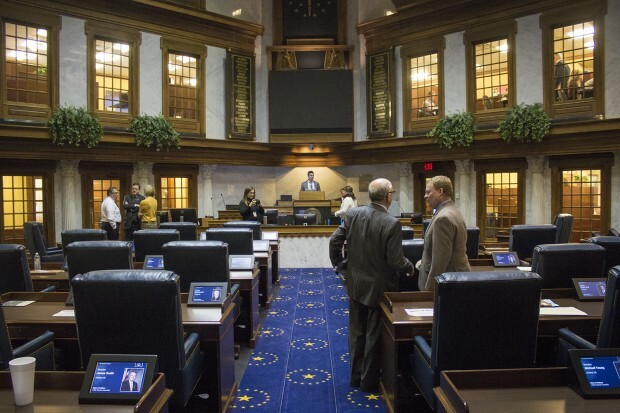 Despite support from both sides of the aisle, Sen. Mark Stoops (D-Bloomington) protested the legislation by offering an amendment that would expand the bill to require all schools that accept public funds, including vouchers, to follow the proposed policy. This would include religious schools that are part of the state’s Choice Scholarship program. Legislation that would offer high school journalists the same legal protections as professional journalists moved closer to law this week. House Bill 1130 would prevent public K-12 schools from disciplining students for expressing their First Amendment rights in a school-funded publication. Committee Chairman Sen. Dennis Kruse (R-Auburn) proposed an amendment to let the State Board of Education decide disputes. “So if there is a conflict between the journalists and the school, the state board would make a final decision to take it out of the hands of the local school,” he says. The amendment was approved and the bill passed the Senate Education and Workforce Committee 10-0. It now heads to the full Senate. In a move supported by the state’s teachers unions, lawmakers advanced a bill that would extend the deadline for collective bargaining until mid-September. Lawmakers and union leaders say it would give teachers and their representatives a more accurate student headcount. Legislation that would fast-track teacher licenses for a military spouse whose partner is assigned to duty in Indiana is moving steadily through the Statehouse. House Bill 1396 has garnered unanimous support during the session. It requires the State Board of Education to adopt the rules on how this type of emergency license will be granted. The bill is expected to be signed into law. HB 1003 is the ISTEP+ replacement plan that requires the State Board of Education to oversee design of a new standardized test. HB 1384 would give the state board oversight in deciding if a private school may remain part of the Choice Scholarship program after it’s rated a D or F for two consecutive years. Current law prohibits schools from accepting new students on vouchers after two years of failing grades. Help us help you! We want to know what you want covered. Have a question or story idea? A specific policy that deserves more explanation? Reach out! Leave a comment or reach reporter Peter Balonon-Rosen at pbalonon@indiana.edu and reporter Claire McInerny at clmciner@indiana.edu.